Holidays can be an expensive luxury: as well as the cost of air flights to reach your destination, you need to pay for accommodation and often a rental car to get around. For many years, “house swaps” have provided a way of easing the financial burden: you allow someone else to stay in your home, and use your car, and in return, you get to stay in their home and drive their vehicle. This set up suits some people, but the idea of opening up your home to someone else doesn’t appeal to everyone. A website called trustedhousesitters.com, takes a different angle: if you agree to move into someone else’s house and to look after their pets, they allow you to stay there, and to use their car, for free. I came across the website when planning our family summer holiday a couple of years ago: I found that pet sitting assignments are all over the world, in many desirable destinations. A city centre apartment in Paris, Rome or New York? A farmhouse in Provence or Spain? A villa in Italy or Switzerland? I signed up to the website, paying €42 for three months membership, which allowed me immediate access to new petsitting jobs as soon as they were posted. I then had to create a “pet sitter profile” for myself, including a short video message and references from people who could vouch for my ability to care for pets. Once I’d set this up, I was able to browse through pet sitting assignments, searching for one that would provide that dream holiday for myself and my family. An asthmatic Bulldog in San Francisco sounded interesting but there were issues with car insurance, so that didn’t work out. I applied for two weeks minding a cat in Sardinia, and for three weeks caring for a Wolfhound in Portugal, but I was too late for both of them. As soon as I saw “three weeks in Crete, minding three dogs and four cats”, I sent off my application, and this time I was successful. The owner, an Englishman, interviewed me by Skype, and the deal was done. He met us at the airport in Crete, and he stayed with us for two days at the start of our holiday, introducing us to the animals and showing us the daily routines. The dogs were to be walked at dawn every day – after 8am it was too hot for them to exercise. Two of the dogs were allowed off the leash, but one of them could never be allowed to run free: he had a history of attacking and killing goats and hens, which did not go down well with the local people. I also learned about the risk of being attacked by the local dogs, which often run free in the Greek countryside. In the past, one of the dogs that I was minding had been nearly killed by a pack of dogs, so I had to carry a stick with me at all times so that I could fend off attackers if needed. The cats were easier to mind: they were semi-feral, and just needed to be fed twice daily. The animal situation became more complicated just before the owner left: somebody dumped two puppies in the scrub land close to his house. 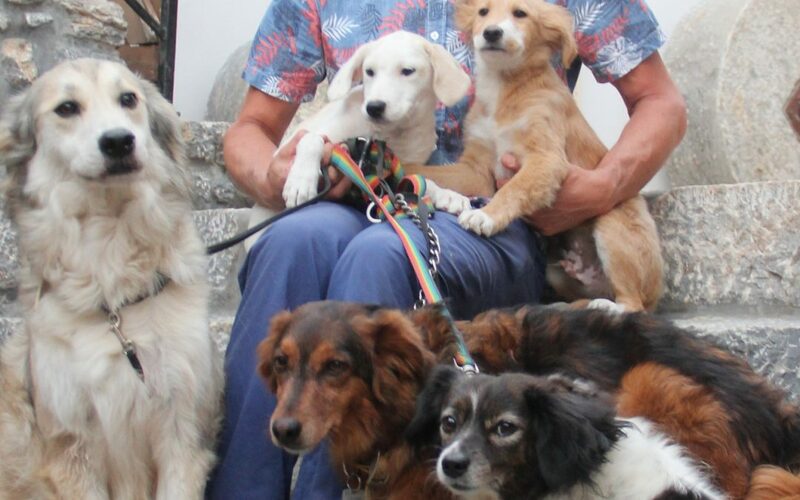 Abandoned animals have a very poor chance of survival in Greece, so we felt obliged to step in to help. Once we’d caught the pups, we agreed to care for them while he was away, and he’d find new homes for them when he came back. We dropped the owner to the airport, and we were on our own: three weeks in Greece, living in an upmarket villa, driving a 4×4 vehicle to the beach, just fifteen minutes away. Walking the dogs every morning in the tranquil Greek countryside was a pleasure. Pet sitting may not be everyone’s idea of fun, but if you’re an animal lover, it’s a great new way of getting good value for a holiday overseas.